The Hub's Homecare Governance project was in the running for the HCSA Procurement and Supply Management Procurement award 2015. Although not ultimately a winner, the Hub was pleased that to be a finalist in a highly competitive shortlist. 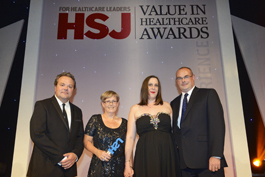 The NHS Collaborative Procurement Partnership, of which the Hub is a part, won the HSJ Value and Improvement in Procurement Award 2015 for its Total Orthopaedic Solutions framework. The East of England NHS Collaborative Procurement Hub and the East of England Neonatal Operational Delivery Network (ODN), have won the prestigious Health Service Journal (HSJ) Value in Procurement Award at the HSJ Value in Healthcare Awards 2014. They were jointly awarded from a record number of entries for their ground-breaking Neonatal Parenteral Nutrition Project, which provides potentially life-saving nutrition for vulnerable premature babies. This is the second honour for the project – in March 2014 the same venture won the Government Opportunities Award for Procurement Initiative of the Year. David John, Chief Executive of the East of England NHS Collaborative Procurement Hub said: “The fact that this highly complex, but very worthwhile project has won a second prestigious national award is further demonstration of the excellent work put in by both the Hub and the Neonatal ODN to achieve it. The award was announced at a gala dinner in Birmingham on 19th March. A wide range of organisations from all over the country took part, presenting their best procurement initiatives from a number of different disciplines. The Hub's award was for its innovative Parenteral Nutrition Project, which helped standardise nutrition for pre-term babies across the Eastern region. David John, Chief Executive of the East of England NHS Collaborative Procurement Hub said: “Winning the GO Award in conjunction with the East of England Neonatal Operational Delivery Network, is a fantastic achievement and is recognition of the Hub’s excellence in procurement when benchmarked against some of the finest procurement initiatives in the country. “We are delighted that our work on the Parenteral Nutrition project has been recognised in this way, particularly as it was a highly complex and ground breaking project, involving 17 different NHS Trusts and numerous stakeholders at all levels. The Hub was also finalist in a separate category in the 2014 GO awards for innovation in procurement. The Hub won the Government Opportunities Procurement Innovation or Initiative of the Year (Health and Social Care) 2012 for the 'Specials Prescribing Toolkit' and was also a finalist in a second category in the same award scheme. 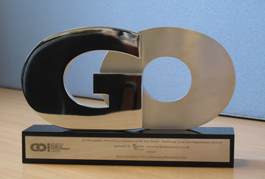 The GO awards recognise innovation, excellence and achievement in public sector procurement across the UK and the winners were announced at a gala dinner in Birmingham in March 2012. As well as winning the GO Procurement Innovation or Initiative Award, the 'toolkit' was a finalist in the GO/John F McClelland Collaborative Procurement Initiative of the Year, as was the NHS Commercial Alliance's Topical Negative Pressure project, spearheaded by the Hub. For the third year running, the Hub - in conjunction with ADSM, was a finalist in the HSJ Efficiency Awards, for its Comprehensive Water Management Project. The Hub was shortlisted in the Efficiency in Procurement Category. The project enabled NHS Trusts to appoint a specialist company - ADSM - to explore how they can help make water efficiency savings and at the same time help the environment by cutting water usage. The Hub’s highly acclaimed ‘Specials Prescribing Toolkit’ was named as a finalist in two separate categories in the HSJ Efficiency Awards 2012. This is the second year running that the 'toolkit' - which has undergone substantial further work in 2011/12 and achieved major additional savings - has been recognised in the HSJ Efficiency Awards. The project was shortlisted in both the Efficiency in Medicines Management and Efficiency in Procurement categories. The 'toolkit', which was designed to help minimise costs and encourage best practice in prescribing special or unlicensed medicines, has been widely circulated across the UK and pharmacy savings of around £3.4 million pounds have been calculated for the East of England alone, with the promise of more to come. Since the toolkit was launched, the East of England has bucked the national trend which has seen the costs of prescribing Special Medicines spiral upwards. The 'Toolkit' also won the Health Business Hospital Procurement Award 2011. The winners were announced at a prestigious ceremony at the Emirates Stadium in December 2011. The toolkit was shortlisted for two awards in the HSJ Efficiency Awards 2011.The project was a finalist in both the Efficiency in Medicines Management and Efficiency in Procurement categories. The Hub was shortlisted for the Government Opportunities Best Collaborative Procurement Award 2009 for its work in developing the Equitable Access to Primary Care programme across the region. As part of the Equitable Access programme, the Hub helped set up 14 new health centres and two new GP surgeries in the East of England. 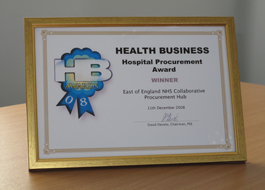 The Hub won the prestigious Health Business Procurement Award in both 2008 and 2007. The annual award scheme rewards excellence in the provision of a range of NHS facilities and services across the UK, including management, technology, procurement and transport. The Hub was honoured for its outstanding work in both the NHS Provider and Commissioning sides of the business. Membership BenefitsCase StudiesA selection of our past projects.